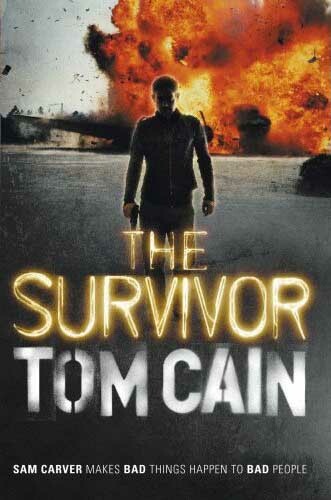 THE SURVIVOR is Tom Cain's second 'Accident Man' novel. (The Accident Man is Samuel Carver, a man who to use the publishers phrase "makes bad accidents happen to worse people"). Sam starts the book setting up an accident to kill off Waylon McCabe, a millionaire involved in dodgy deals around the world. The survivor of the title is McCabe who five years after escaping the accident, finds out that he is dying from the effects of the crash and wants to bring about a Muslim terrorist attack to show how serious the Muslim threat is to the West. The Russian secret service has left suitcase bombs at various locations around the world and copies of the list are in circulation, with McCabe wanting to obtain one of the weapons to cause Armageddon (with the blame attributed to the Muslims). He therefore employs former US General Kurt Vermulen to assemble a team to locate one of these nuclear weapons. Carver meanwhile has been savagely tortured and is lying in a hospital bed being looked after by his girlfriend Alix: Alexandra Petrova a former Russian spy. The Russian secret service use Alix to get close to Vermulen's office to find out what he is doing. When Carver recovers, he discovers his girlfriend is missing and finding out that she is in danger, he sets out to find her. On the way he meets up with Georgian mobsters and intelligence teams trying to stop him getting to Alix and Vermulen. The story takes Carver around Europe trying to find out the details of the plot whilst avoiding the many people trying to kill him. The story builds and you wonder if Carver can save Alix and prevent the bomb plot. This second novel makes me want to read the previous book and become more acquainted with this character. This is a great action thriller in the same vein as Brett Battles' character Jonathan Quinn from THE CLEANER and THE DECEIVED. Read another review of THE SURVIVOR.